It took an Australian, Reagan Maya-Jones to introduce the first muslin swaddle blanket to the USA in 2006 and her company Aden & Anais has been going strong ever since with its cool wraps and so much more for babies. Their classic silky soft muslin swaddle blanket combines breathability and versatility with soft viscose made from bamboo, making it the most luxurious fabric to use on your baby's delicate skin. And, as if off-the-charts softness isn't enough, the silky soft swaddle can also be used as a stroller cover, burp cloth, nursing cover and more. Made from luxuriously soft and comfy cotton muslin. Breathable fabric reduces chance of baby overheating. Natural give of fabric ensures a comfortable swaddle. Contemporary prints and colours that complement your style. 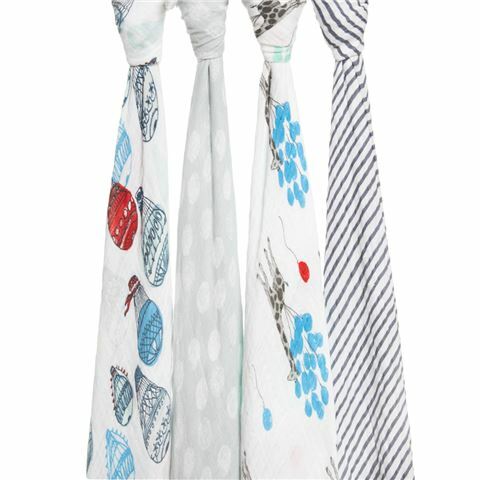 Generous size allows for these swaddles to be used as a stroller or nursing cover; as a changing pad cover; as a burp cloth; as a tummy time blanket and more. Cold machine wash and tumble dry on low heat. Presented as a set of four, each with a different print, in an Aden + Anais gift box. Dimensions: 120cm (l) x 120cm (w).